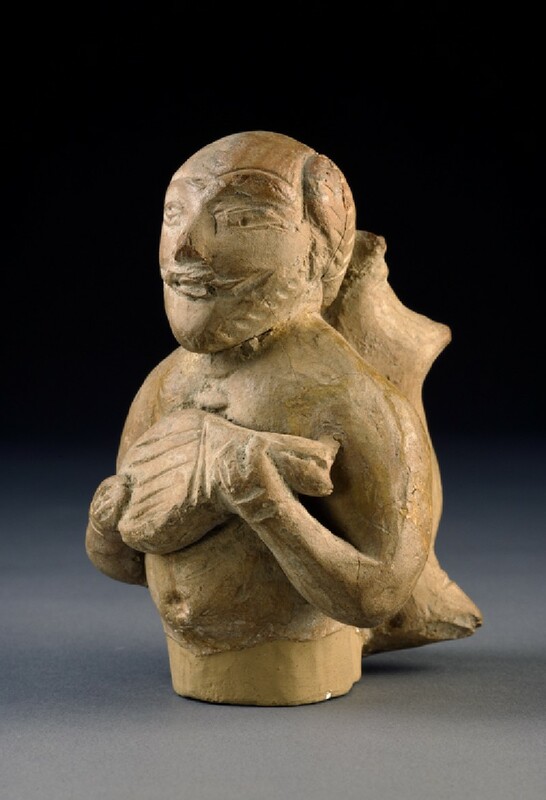 Collected by Sir Aurel Stein in his travels, this fragmentary figure plays a stringed instrument and carries a goat-skin water bag on his back. This is perhaps the most lively of the terracotta finds by Sir Aurel Stein in Khotan, and one of the few figurines. The light colour is characteristic of the terracottas from Yotkan, and so is the technique of the lightly incised eyes, but the bearded face is conceived fully in the round. Most of the detached heads found at Yotkan on the other hand are doll-like and flattened. The figurine illustrated here lends some credence to the judgement of a contemporary that the Khotanese, as well as being frivolous, were exceptionally fond of music.